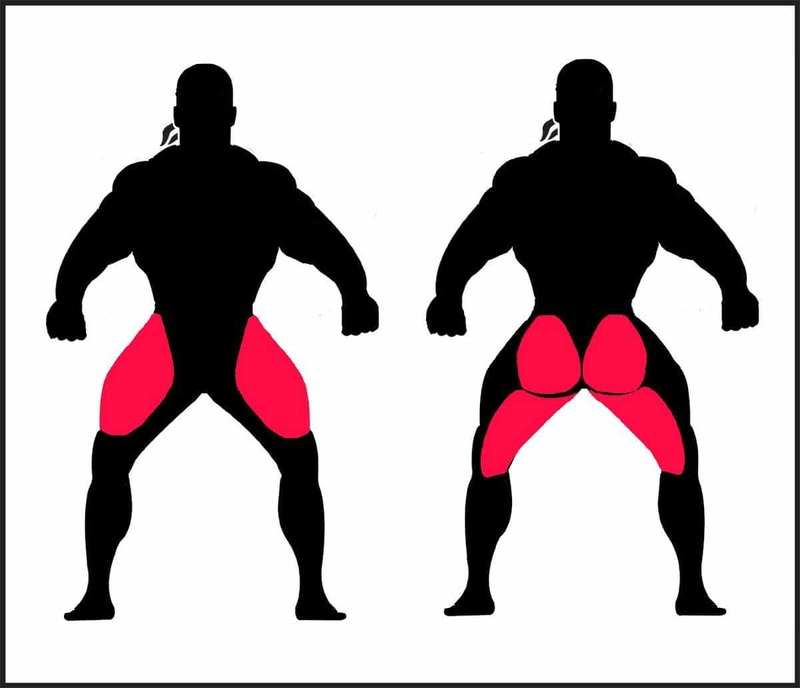 The front squat is an incredibly effective muscle building exercise for your legs. It’s a great tool for teaching new weight lifters how to squat, a very good compound exercise for your legs, and is highly useful for core training. Front squats should be part of your training program. As is the back squat, front squats are primarily a leg exercise. The front squat places greater emphasis on your quadriceps than back squats and it also works your core to a much greater degree. You should not expect to lift nearly as much weight as you can with the back squat. Since the bar does not rest on your shoulders over your center of gravity, front squats are inherently less stable than back squats. This forces you to use your core to a much greater degree to stabilize the weight throughout the lift. Front squats force you to perform the squat with very strict technique – if you begin to lean forward you will be unable to maintain control of the weight. To execute front squats you must keep your chest up and upper body more erect than back squats, this allows you to sink your hips and buttocks easily into the hole. Since it forces you to perform the exercise with proper technique the front squat is a good exercise for teaching new weight lifters how to squat. Setup for the lift: Although with the front squat the barbell weight will not be as heavy as you typically will lift with the back squat, your setup remains very important part. Energy wasted setting up and stepping out of the rack results in less weight lifted, fewer repetitions completed, and a less productive workout. A good setup facilitates a good training set. Hand and Barbell Placement: There are two methods of holding the barbell for the front squat, Olympic style, and crossed arms. Olympic style: Hold the bar with an underhand grip, your hands should be a fist-width outside your shoulders. Lift your elbows and push your shoulders forward and slightly up to let the bar roll onto your fingers and into the groove between your delts and throat. Crossed arms: Since the Olympic style grip requires greater degree of flexibility an can be painful for some lifters you may choos the crossed arm grip. Cross your arms at the wrists and grip the bar just inside your delts with an overhand grip. Lift your elbows and push your shoulders forward and slightly up to let the bar roll onto your fingers and into the groove between your delts and your throat. Step under the bar keeping your feel close together and your hips directly underneath you. Take a deep breath into your chest and use your legs to raise the bar up out of the rack. Keeping your elbows high take at least two, but no more than three short, quick steps backward away from the rack. When stepping back, place your feet just outside shoulder width apart with your toes pointed out at an angle. Practice placing your feet in exactly the same position every time without shuffling them for position – this wastes a significant amount of energy! Keep your elbows high throughout the lift – this will help you keep the barbell high on your delts, and reduce your tendency to lean forward. Take another deep breath, hold it in your chest and tighten your abs to tighten your core. Keeping your torso as upright as possible, sit into the squat as if you are sitting into a chair. Descend, lowering your hips until the upper surfaces of your thighs are at least parallel with the floor. Drive upward explosively out of the hole, driving your heels through the floor. Force your knees outward and your hips forward as you drive up. Begin exhaling once you’re out of the hole, letting your breath out as you lock out the rep. Complete the lift by standing fully erect, knees locked, and hips forward. Select a weight that you can complete all of your planned sets and reps with proper technique. Your last reps on your last 1-2 sets should be difficult without spotter assistance. You should not expect to do much more than half the weight you typically can lift with back squats. Improper depth: Failing to descend at least until your thighs are parallel with the floor reduces the effectiveness of the exercise. It can also create muscle imbalances between your quads and hamstrings which places unnecessary strain on your knees. Dropping your elbows: Letting your elbows drop will allow your chest to sink causing the bar to roll forward. This makes it very difficult to remain upright, and will reduce the weight you can lift and the number of repetitions you can complete. Use a spotter when performing front squats. Make sure your spotter knows how to properly spot you for this lift. Always squat with proper technique. Select a weight you are able to lift with correct form. Performing this exercise incorrectly reduces the effectiveness of the exercise and increases your chance of injury. Pause squats: To make the exercise more challenging, pause at the bottom for two seconds before completing the lift.